SystemSwift instantly makes your computer faster and fixes common problems. 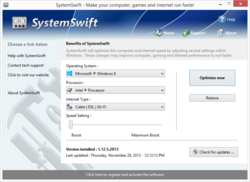 SystemSwift 2 was available as a giveaway on March 30, 2016! 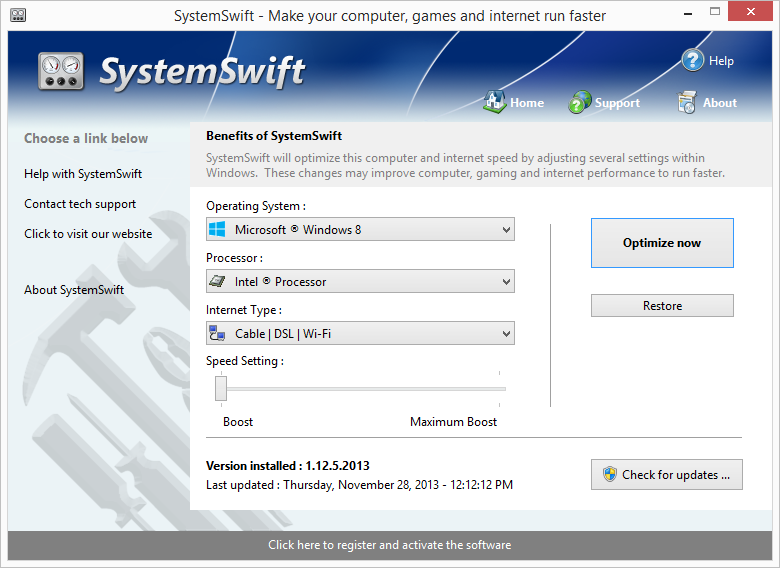 SystemSwift sets the standard for PC and game optimization software. SystemSwift instantly makes your computer faster and fixes common problems associated with frustrating slowdowns and errors, squeezes out every last bit of performance your computer and games are capable of and increases the speed of your internet connection. Do you remember when you first turned your brand new computer on and how fast it worked? With SystemSwift and a click of the mouse you can bring back this speed to your computer instantly. SystemSwift quickly scans your computer for common problems and fixes them, it then makes several permanent changes to Windows so your computer feels like it is brand new once again. Don't deal with a slow computer and make tasks take longer to complete, install SystemSwift and make your computer run faster. How would you improve SystemSwift 2 ? Why have people stopped listing alternative or comparable freeware/shareware with each giveaway? These were usually my first port of call before reading any other reviews. They immediately put a benchmark in my mind of the software on offer and I find that they are much more reliable than sites like alternativeto.net. Bring back the lists please. I miss them :-(. Why have people stopped listing alternative or comparable freeware/shareware with each giveaway? These were usually my first port of call before reading any other reviews. They immediately put a benchmark in my mind of the software on offer and I find that they are much more reliable than sites like alternativeto.net. Bring back the lists please. I miss them :-(. This software changes nothing in proformance. I've run the benchmarks. All it does is use up memory. Don't waste your time. And DON'T pay for it. This software changes nothing in proformance. I've run the benchmarks. All it does is use up memory. Don't waste your time. And DON'T pay for it. If your computer seems slow you would be better advised to run CCleaner, then use CCleaner's tool for preventing unnecessary programs from loading at startup, then run CCleaner's registry cleaner. After that run a full boot-time anti-virus scan. If that's not enough, add more memory and an SSD (especially now that SSDs and RAM memory are cheaper than they have ever been!). Your old hard drive slows down over time and even more so as it fills up. Clone the old hard drive onto an SSD and be amazed at how quick and snappy everything becomes. starvinmarvin, "clone the old hard drive onto an SSD..." is nonsens. There is no SSD so big (yet). Mike, yes there is.....if you have the money! Mike, I've seen lots of 1 TB SSDs for sale, and I wager you could find a bigger one. SSD prices have been dropping amazingly in recent times. Any time the price of hardware that's been out a while suddenly starts to drop a lot faster, you can bet some better technology is about to hit the market! Do I need today’s give away if I have installed process lasso? david, I have been using process lasso for a long time with good results. The short answer is no you don't need this! On the other hand I keep my PC backed up 3 ways and should it become bogged down for unknown reasons I normally just wipe the drive and reinstall. If the PC isn't broken it is back to new! I would not trust this program and I don't trust a number of normally mentioned alternative programs. david, I have been using process lasso for a long time with good results. The short answer is no you don't need this! On the other hand I keep my PC backed up 3 ways and should it become bogged down for unknown reasons I normally just wipe the drive and reinstall. If the PC isn't broken it is back to new! I would not trust this program and I don't trust a number of normally mentioned alternative programs. Rick Martin, Thanks a million. I created a restore point before installing and running this. After restarting computer, I have not noticed any appreciable difference to warrant using it. States on website when getting activation code that it is good for 30 days. Will use for a few days to see if I notice anything improved. I created a restore point before installing and running this. After restarting computer, I have not noticed any appreciable difference to warrant using it. States on website when getting activation code that it is good for 30 days. Will use for a few days to see if I notice anything improved. It's a very odd piece of software - complete opposite of the usual optimizer's were all used to. No option to create a restore point, you have no idea what it is going to do, it doesn't differentiate between 32bit & 64bit systems (alarm bells - 32/64 need different settings); simply there are no options, just a single optimize button. A real leap in the dark. It's a very odd piece of software - complete opposite of the usual optimizer's were all used to. No option to create a restore point, you have no idea what it is going to do, it doesn't differentiate between 32bit & 64bit systems (alarm bells - 32/64 need different settings); simply there are no options, just a single optimize button. A real leap in the dark. No thanks. You're exactly right being a leap in the dark. I refuse to install this type of program because I want to see what's being done. My guess is that it makes some changes to the registry that can be done manually. There statement "With SystemSwift and a click of the mouse you can bring back this speed to your computer instantly." So their saying after installing roughly 50+ programs from GOTD, that you're going to see the same speed as when you first bought it. Hogwash! blea101, You're exactly right being a leap in the dark. I refuse to install this type of program because I want to see what's being done. My guess is that it makes some changes to the registry that can be done manually. There statement "With SystemSwift and a click of the mouse you can bring back this speed to your computer instantly." So their saying after installing roughly 50+ programs from GOTD, that you're going to see the same speed as when you first bought it. Hogwash! Thanks GOTD, but no thanks. Never heard of this developer before and with no options to control what is and isn't changed I would prefer to be able to select whether something is "optomized" or not ... Who knows what damage this could do and given that there is no option to create a restore point. I for one am not prepared to play Russian Roulette with my system ... Thank but no way dude! blea101, Never heard of this developer before and with no options to control what is and isn't changed I would prefer to be able to select whether something is "optomized" or not ... Who knows what damage this could do and given that there is no option to create a restore point. I for one am not prepared to play Russian Roulette with my system ... Thank but no way dude! Actually, there is always an option to create a restore point. You go to System Properties and then click on the System Protection tab. From there, you will see Create a restore point. Click the create button and you are done. Lenny, Actually, there is always an option to create a restore point. You go to System Properties and then click on the System Protection tab. From there, you will see Create a restore point. Click the create button and you are done. This program may cause a placebo effect where it may seem like it made your computer faster but let's be honest here. The only true way of getting a faster computer by any means is by upgrading the parts in it. Errors in the OS will often cause the system to run most sluggishly, good programs of this type remove these errors, often with a great improvement in system performance. Deputydawg, Errors in the OS will often cause the system to run most sluggishly, good programs of this type remove these errors, often with a great improvement in system performance. I speak from experience. Deputydawg, OR BY REFORMATTING THE DRIVE AND STARTING OVER. Updates and new installs of software are the main reasons a person's system slows down. And, all the Windows' updates, as well, will bog down your PC. This is why you should leave as many optional updates from Microsoft, OFF and only use the SECURITY updates, BUT CHECK THEM FIRST before you install them. Always make a system IMAGE or Restore Point before you install anything new. I have a training/testing system I use to test these things out. Very few software I have tested, has been very good. I measure everything as well thru diagnostics and testing, before and after installs. Only use software YOU KNOW IS PROVEN SAFE or else install it on a TEST PC. I would never install any freebie software on my main computer. NEVER. Deputydawg, OR BY REFORMATTING THE DRIVE AND STARTING OVER. Updates and new installs of software are the main reasons a person's system slows down. And, all the Windows' updates, as well, will bog down your PC. This is why you should leave as many optional updates from Microsoft, OFF and only use the SECURITY updates, BUT CHECK THEM FIRST before you install them. Always make a system IMAGE or Restore Point before you install anything new. I have a training/testing system I use to test these things out. Very few software I have tested, has been very good. I measure everything as well thru diagnostics and testing, before and after installs. Only use software YOU KNOW IS PROVEN SAFE or else install it on a TEST PC. I would never install any freebie software on my main computer. NEVER. The program gives absolutely no feedback to the user, no customization is possible, people have just to trust it blindly. A very high level of trust is required by this program, certainly a concern. Even more concerning is the fact that the Restore function, according to the help file, restores to original factory settings, does this mean any changes you have previously made are lost? Nowadays there are really good programs that keep your OS functioning to a high level. They always have a proper undo function and an explanation of the changes about to be made. This is the only type you should use, blind faith has no place in computing. A very high level of trust is required by this program, certainly a concern. Even more concerning is the fact that the Restore function, according to the help file, restores to <strong>original factory settings, </strong> does this mean any changes you have previously made are lost? Nowadays there are really good programs that keep your OS functioning to a high level. They always have a proper undo function and an explanation of the changes about to be made. This is the only type you should use, blind faith has no place in computing. How can we register this software, there should be an easy registration console put under the about section. is it me or such a facility hasn't been implemented? Did you even bother to look at the readme.txt that was included? The very first thing it says is where to go to register the software. waschin chin, Did you even bother to look at the readme.txt that was included? The very first thing it says is where to go to register the software. Website looks nice, however, there's no information on what it actually does and if the changes are reversible, not even in the FAQ section. My PCs have been optimise for specific needs, with no idea of what this does it won't be going on them. "•Changes are made to the Windows system permanently, allowing you to perform a single one time tune-up to increase performance forever." Umm did you not see the big "restore" button right under the "optimize" button?!? That would mean any changes it makes if you don't like them you can push that button and it restores everything back to where you had it before. Bob, Umm did you not see the big "restore" button right under the "optimize" button?!? That would mean any changes it makes if you don't like them you can push that button and it restores everything back to where you had it before. There you enter your name and submit it. The key instantly appears. The install was quick and easy as was the registration process. I selected the Optimize now button. It checked my system and then began to make changes. When it was done I was told I needed to reboot my computer to make the changes take effect. However it does not tell you what these changes are. You will need to trust this program not to harm your computer wuth the changes it makes. I am no computer expert but I at least want to look over any changes made before I let them happen. Due to this lack of information I chose to uninstall the program via reboot. To register this program you are asked to visit this page,,, http://www.pgware.com/promo/gotd/systemswift/ There you enter your name and submit it. The key instantly appears. The install was quick and easy as was the registration process. I selected the Optimize now button. It checked my system and then began to make changes. When it was done I was told I needed to reboot my computer to make the changes take effect. However it does not tell you what these changes are. You will need to trust this program not to harm your computer wuth the changes it makes. I am no computer expert but I at least want to look over any changes made before I let them happen. Due to this lack of information I chose to uninstall the program via reboot. I agree with you 100%. I to would like to know what changes are going to be made and be able to decide whether I want them to be made or not. I don't want to wait until afterwards and then find out something is wrong and have to restore it back to normal. gpc111, I agree with you 100%. I to would like to know what changes are going to be made and be able to decide whether I want them to be made or not. I don't want to wait until afterwards and then find out something is wrong and have to restore it back to normal. In almost every instance, software offered here expressly excludes any updates to the version of the software downloaded on the day it is offered. From the authors website, the software, System Swift 2, is updated frequently, which means that today's download will in every likelihood be out of date in a week or two or months time. Given that this is a performance enhancing software then IF the update/s to this software is going to be frequent, then would the author, PGWARE, consider some latitude with today's download and include a month's free updates, for example. As always, thanks GOTD and PGWARE. In almost every instance, software offered here expressly excludes any updates to the version of the software downloaded on the day it is offered. 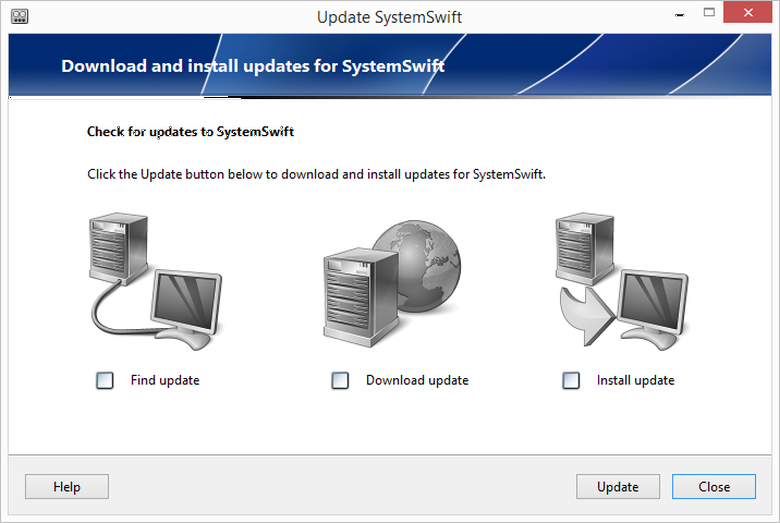 From the authors website, the software, System Swift 2, is updated frequently, which means that today's download will in every likelihood be out of date in a week or two or months time. Given that this is a performance enhancing software then IF the update/s to this software is going to be frequent, then would the author, PGWARE, consider some latitude with today's download and include a month's free updates, for example. As always, thanks GOTD and PGWARE. You are correct somewhat. But if you also read over everything it also states that this comes with a 6 mos. license. Therefore everyone would get updates for that 6 mos membership time frame. So PGWARE did give some latitude with today's download. Hughjocapivvy, You are correct somewhat. But if you also read over everything it also states that this comes with a 6 mos. license. Therefore everyone would get updates for that 6 mos membership time frame. So PGWARE did give some latitude with today's download. Bernice Jenkins, thank you for your reply. Let me assure I have read over everything, but nowhere can I find the "6 mos" license everyone would get as you have referred above. It is certainly not in the readme.txt file in the zip that came with the download, nor is it referenced anywhere by PGWARE on this page, nor is it referenced in the T&C's link below the "DOWNLOAD" button above. Please let me know where you saw it to enlighten me? OR, are you perhaps with PGWARE and are letting us all into a little secret. Bernice Jenkins, thank you for your reply. Let me assure I have read over everything, but nowhere can I find the "6 mos" license everyone would get as you have referred above. It is certainly not in the readme.txt file in the zip that came with the download, nor is it referenced anywhere by PGWARE on this page, nor is it referenced in the T&C's link below the "DOWNLOAD" button above. Please let me know where you saw it to enlighten me? OR, are you perhaps with PGWARE and are letting us all into a little secret. I believe I saw the '6 months' issue associated with the Other piece of software on offer today. Also, it is not clear that a 6 month license entitles a user to any sort of updates, anyway. Generally this sort of license language is nothing more than the right to use the software for that period of time. The 6 months license is given with the Artipic software, which is also a free download for today and not with the System Swift 2 offered on this page. Unless stated otherwise, a 6 months license will allow the user to update the free software applicable only to the version offered here, and after this period, it will remain free to be used for personal use and as long as it is on your computer, however long this may be. Generally, these updates exclude upgrades to newer versions of the software. These you will have to buy. It is important to ALWAYS check that the "Update Automatically" is UNCHECKED in the "Settings or Preferences" to prevent the software from updating automatically, in which case if it does update automatically, you will lose the benefit of the "free-ness" of the software downloaded here. Rich, The 6 months license is given with the Artipic software, which is also a free download for today and not with the System Swift 2 offered on this page. Unless stated otherwise, a 6 months license will allow the user to update the free software applicable only to the version offered here, and after this period, it will remain free to be used for personal use and as long as it is on your computer, however long this may be. Generally, these updates exclude upgrades to newer versions of the software. These you will have to buy. It is important to ALWAYS check that the "Update Automatically" is UNCHECKED in the "Settings or Preferences" to prevent the software from updating automatically, in which case if it does update automatically, you will lose the benefit of the "free-ness" of the software downloaded here. Enjoy.